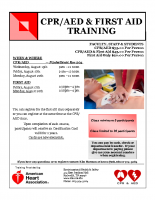 Environmental Health & Safety Invites faculty, staff & students to register for CPR/AED and First Aid Training. You can register for the first aid class separately or you can register at the same time as the CPR/ AED class. To register please contact: Kim Harmon at kcox2@utk.edu or 865-974-5084. Provide your name, building location, department and account number that this class will be charged to. If you will be paying personally please provide your name and building location, and you can pay by cash or check. If you are paying cash come by the Environmental Health and Safety office at 414 East Stadium Hall. Checks can be submitted through campus mail. Remember, certifications expire after 2 years, and all certification cards are now electronic.